LightRanger 2 click carries VL53L0X IC from STMicroelectronics, the world’s smallest Time-of-Flight ranging and gesture detector sensor. The click is designed to run on either 3.3V or 5V power supply. LightRanger 2 click communicates with the target microcontroller over I2C interface and the following pins on the mikroBUS™ line: RST, INT. The VL53L0X sensor can measure absolute distances up to 2m. Reported range is independent of the target reflectance. The VL53L0X integrates a leading-edge SPAD array (Single Photon Avalanche Diodes) and embeds ST’s second generation FlightSense™ patented technology. 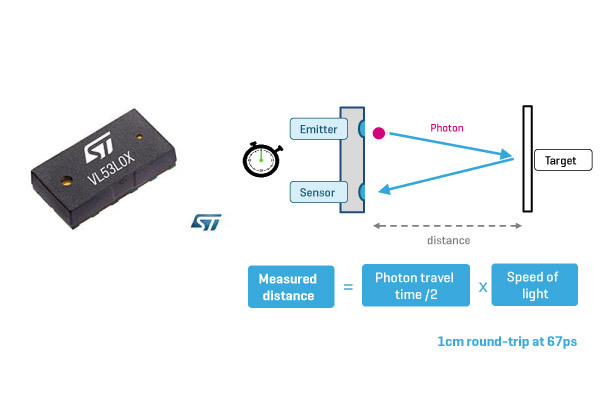 FlightSense™ technology measures the time it takes for a photon to reach the nearest object. The photon travel time is multiplied by the speed of light, and from there a distance is calculated. The photon travel time is not affected by reflectance, and this kind of technology is immune to ambient illumination and optical path variations. The VL53L0X’s 940nm VCSEL emitter (Vertical Cavity Surface-Emitting Laser), is totally invisible to the human eye, coupled with internal physical infrared filters, it enables longer ranging distance, higher immunity to ambient light and better robustness to cover-glass optical cross-talk. The average power consumption at 10MHz is 20mW, and while in standby mode the typical power consumption is around 5uA. Applications User detection for Personal Computers/ Laptops/Tablets and IoT devices, obstacle detection, distance measurement in applications, etc.